Ableton Live 10 is released today. Ableton Live is a major DAW (Digital Audio Workstation) software in Windows and macOS for producers, composers and disc-jockeys. 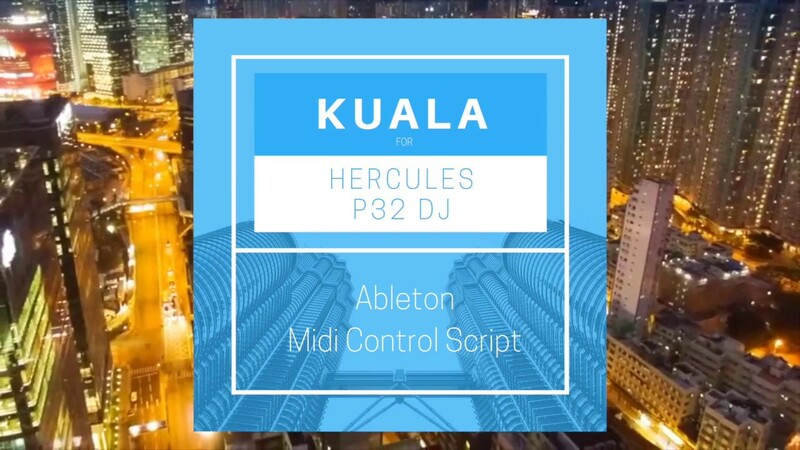 Hercules P32 DJ can control Ableton Live with the script Kuala from Remotify. Here is Ableton Live press release. The new Live delivers four bold new devices, workflow refinements and a re-designed sound library. Live 10 also brings new functionality and high-res visualizations to Push. Plus, Max technology is now fully integrated into Live 10 Suite for faster, more stable performance. • Wavetable is Ableton’s latest synth—immediately playable with a vast sonic palette. • Echo produces delay sounds from classic textures to soundscapes, wailing feedback and experimental atmospheres. • Drum Buss is a one-stop workstation for drums, capable of adding subtle character or completely bending and breaking drums. • Pedal brings the character of analog stomp boxes to Live with separate circuit-level models of overdrive, distortion and fuzz guitar pedals. • Capture recalls an idea after it has been played and turns it into a MIDI clip with groove and feel intact. • Multiple MIDI clip editing allows users to see the content of two or more clips in one detail view. • Groups within groups allow for greater flexibility when mixing and improves Set organization even with lots of tracks and a detailed arrangement. • A multitude of refinements including improvements to Arrangement View workflows, Browser Collections, I/O renaming, note chasing, and much more. • A new step sequencing layout allows simultaneous note sequencing and real time playing. • MIDI note view allows navigation and refinement of the notes in a pattern in context directly on the Push display. • Deeper integration with Live 10 Suite means devices now load faster, use less CPU and feel more like Live’s native devices. Ableton Live 10 is available for purchase now from Ableton.com and at local retailers. 599 EUR / 749 USD / 539 GBP for Live Suite. 649 EUR / 799 USD / 579 GBP for Live Suite. Ableton makes products for music makers to create, produce and perform music. These include Live, a software that combines traditional studio technologies with the freedom of working without a timeline; Push, a hardware instrument for handson playing and composing with Live; and Link, a technology that allows multiple devices to play in time together over a wireless connection. Ableton was founded in 1999 by musicians in need of new creative tools. The first version of Live was released in 2001. The company is led by its founders from its headquarters in Berlin, and has additional offices in Los Angeles and Tokyo. About 300 people work at Ableton across the world. Remotify has released Kuala, a script to use P32DJ in Ableton Live. PCDJ Dex 3.8, a major update of PCDJ Dex, will include P32 DJ support. PCDJ 3.8 Release Candidate 2 can be downloaded for Windows and Mac on https://www.pcdj.com/dj-mixing-software-dex-3-8-rc2/. To control PCDJ Dex 3.8 on P32 DJ, just connect P32 DJ to your computer before running PCDJ Dex 3.8: the software uses instantly the controller and its audio interface instantly. Select the 2-deck skin in PCDJ Dex, and you can use P32 DJ. P32 DJ mixer controls (browser, equalization, volume, crossfader) & transport buttons (Play, Cue, Sync) control in PCDJ Dex the functions fitting their label. P32 effect knobs and push key control 3 effects per deck, the loop rotary button controls the loop length, and the loop+Shift controls the pitch of the track, the search rotary buttons browse in the track loaded on the deck, and Shift+Search controls the filter. Mayur Jumani has just announced here on Facebook account a video clip of a song called Guide. Cinematography / Video Editing - Kierto.